There are countless cop shows on television right now, but none of them speak to audiences with such powerful realism. This aggressive thriller throws audiences into the center of the chase like never before. Jake Gyllenhaal (“Source Code” 2011) and Michael Peña (“Tower Heist” 2011) are young LA police officers who uncover a secret, making them prime targets of the country’s most dangerous drug cartel. The film begins with Officer Taylor (Gyllenhaal) speaking into a camcorder while in the LAPD locker room. He introduces himself and explains that he is making a documentary about the life of a cop for one of his classes. His partner, Officer Zavala (Peña) is unwillingly brought into the picture to provide commentary but he declines as he “only has his trunks on.” This is the start of an entertaining banter between these two partners, one of the lighter scenes in the movie. 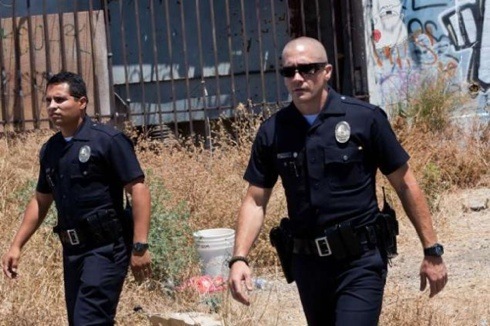 The realism of “End of Watch” may remind audiences of “Cops” but Ayer takes it to an entirely different level, as he is shamelessly candid about the dangers these men face daily. We are with these cops every step of the way. This gritty police action-drama is certainly not for those with a weak stomach. With a handheld camera, we witness graphic scenes filled with blood, drugs, human trafficking, shootings and stabbings among other things. Officer Taylor even wears a camera on his lapel so we don’t miss a beat. The film isn’t entirely grotesque, however, as we see their struggles and vulnerabilities out of the uniform, again, making their roles complete. Both actors are brilliant. Gyllenhaal is bald and built, a different character for him. Viewers will appreciate the heart to heart talks (or should I say “bro talks”) between Officer Taylor and Officer Zavala. They have incredible chemistry, which solidifies their undeniable brotherhood. I found myself laughing out loud at some of their witty one-liners to each other. The duo isn’t restricted to the squad car, either. They even risk their lives to save a family from a burning building. I can guarantee that you will feel just as claustrophobic, short of breath and tense as the officers crawling below layers of dense smoke. It is yet another reminder of how much we should appreciate our servicemen who put their life on the line everyday. There are many scenes that make you wonder how one could withstand these circumstances on a daily basis. A scene that particularly stands out is when Office Taylor finds small children locked in a closet wrapped in duck tape. At one point, Officer Taylor asks Officer Zavala if he thinks of himself as a hero. Both of them stared at each other like it was a ridiculous question. To them, it is just another day in South Central LA. Janet, Gyllenhaal’s innocent and sweet love interest is played by Anna Kendrick (“Pitch Perfect”). In a wedding scene, Gyllenhaal and Kendrick do a choreographed dance that is quite impressive and comical. Gabby, played by Natalie Martinez, is Peña’s fun-loving, confident wife. Cody Horn (“Magic Mike”) and America Ferrera (“Ugly Betty”) are respectable as tough female officers who play just like the boys. Although we spend the most time with Gyllenhaal and Peña, we never get sick of them. In fact, we want more. Bottom Line? Peña and Gyllenhaal are on top of their game and we are with them every step of the way. Despite being violent, graphic and loaded with explicit language (“F-bomb every other word) this intense action drama sends an excellent message. Be forewarned that this is not for those with a weak stomach as the shaky handheld camera can cause motion sickness. One of the best American cop movies I’ve seen in a while. These are the guys you want watching your back.